Last Wednesday Arsenal's Champions League tie against Roma went to penalties - but the real shoot-out for me was in the Crown & Sceptre pub on Foley Street, between @solle's iPhone and my Nokia N95. It was 'London IA in the Pub' night, but Matthew and I were a little distracted by the game. Once it went to extra-time we nearly ducked out to a nearby pub that had Sky, but instead we ended up watching the penalty shoot-out in text format on our respective phones. If you'd told me as a kid that I'd be able to do that in the future, I'd have been impressed. As it is though, we live in a slightly rubbish version of the future. Even in Central London you get pockets of poor 3G signal, and of course, our pub was in one of them. And I have to assume that in the ubiquitous mobile network future, we'd have actually been able to watch the game itself live, rather than just getting text updates. Now, they say the future is here but just unevenly distributed, and it was certainly unevenly spread between us. 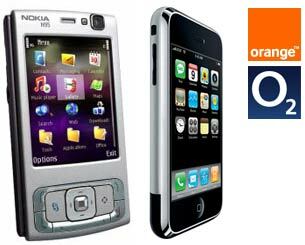 I was using a Nokia N95 on Orange. @solle was packing an iPhone on O2. Somewhere between the event happening in Rome, a TV signal getting to Television Centre, a BBC journalist bashing stuff into a CMS, the content being pushed to live servers, and our respective requests being routed through our telco networks, a rip in the fabric of time and space opened up. That can be the only explanation for how it turned out that on my phone Arsenal were ahead 2-3 in the shoot-out, whilst on @solle's phone they were already through to the next round. Well, I suppose it might just be that Orange have a more aggressive caching set-up than O2, but I'm sticking with my Doctor Who style 'mild peril about the fabric of the universe' theory! By Martin Belam on 17 March 2009. The rip in the fabric of space and time might explain why the London Metro next morning was only managing to report that the game had gone to extra time, with no mention of the penalty shoot out. I still mean that the Nokia N95 is an better phone, but N95 do not have the unique touch screen like the iPhone. I wonder why people even think of bogus comparisons like this one, no offenses Martin. With the powerful array of apps the Iphone has, the Nokia N95 (a technological marvel of its time) doesn't even come close. Touch makes life so easy. Whereas the N95 gets extremely sluggish if you have alot of images and videos on your phone.